The Nimble predictive All Flash array combines the speed of flash with the power of InfoSight Predictive Analytics—radically simplifying operations while delivering 33% to 66% lower TCO than other all-flash arrays. Backed by Nimble Timeless Storage, there is no need to pay for optional software and forklift upgrades are a thing of the past. Nimble flash arrays are cloud ready—providing an easy on-ramp to the cloud through Nimble Cloud Volumes. All-flash performance at less than the cost of legacy performance disk solutions and one to two-thirds lower TCO than other all-flash arrays. Non-stop availability delivers 99.9999% measured uptime through InfoSight Predictive Analytics and no single point of failure hardware and software design. Storing backup copies on all-flash arrays can be cost-prohibitive. That’s why Nimble cost-optimized adaptive flash arrays can be used for backup, DR, test/dev and archival even when primary copies are stored on all flash. Nimble All Flash array scale-out cluster, managed as a single entity, can nondisruptively scale beyond the limits of other all-flash arrays to over 8 PB with more than 1.2 million IOPS at less than 1 ms response time. Moreover, with scale-to-fit, grow capacity and performance of an array independently and nondisruptively. The Nimble AF1000 All Flash array and Nimble AF3000 All Flash array are the perfect entry points for all IT organizations that require speed and economy for performance-sensitive workloads. The Nimble AF5000 All Flash array and Nimble AF7000 All Flash array offer high performance and attractive economics for performance-sensitive workloads that need the best blend of price, performance, or scalability. The Nimble AF9000 All Flash array is designed for consolidating multiple large-scale performance-sensitive applications with aggressive performance and high-scalability demands. Nimble All Flash arrays support iSCSI and FC storage protocols. The performance benefits of all-flash storage might be clear, but there are other critical criteria to consider when evaluating flash technology. Here are five insights that will help you ask the right questions during your evaluation. Flash is fast. But most all-flash arrays are expensive and can’t scale to the needs of all applications. Look for flash storage that adapts by scaling performance and capacity separately to match costs and service-level agreements (SLAs) for all applications. Don’t waste time dissecting resiliency schemes. Instead, ask your vendor to guarantee the uptime number you will experience. This goes beyond a theoretical or claimed measured number. Look for guaranteed uptime of 99.9999% or higher. Forget fancy portals and GUIs. Flash storage should simply work out of the box. The management interface should predict and prevent problems, predict and plan future needs, and provide visibility from storage to your virtual machines. Predict, prevent, and plan so you can manage effortlessly. costs when used with smart software for high reliability and without a performance penalty. Backup and disaster recovery (DR) adds costs and complexity. Look for efficient snapshots and data replication that’s included for free. To save on flash costs, you should be able to directly backup from flash to disk, without any additional tools or costs. Get the random storage I/O performance that virtualized environments demand. Achieve high throughput at sub-millisecond latencies for random reads and writes to storage, with dynamic caching of active data and a write-optimized data layout. Nimble Storage tops the competition in All-Flash scale out (8.2PB effective) and Read/Write performance (1.4M/1.2M IOPS). Get the random storage I/O performance that The Nimble Unified Flash Fabric allows you to choose all-flash for absolute performance, or adaptive flash to cost effectively deliver high performance. And you can transparently migrate Virtual Machines (VMs) between a mixed cluster of all-flash and adaptive flash arrays to meet changing performance needs with no downtime. Nimble has VM-centric storage that supports Storage Policy Based Management. Data Protection that integrates through VMware (VAAI, VASA) and Microsoft (ODX, VSS) allows non-disruptive Disaster Recovery (DR) via VMware Site Recovery Manager. Nimble invests in technical alliances with VMware® and Microsoft® for server virtualization, and is a VMware VVOL 2.0/VASA 3.0 design partner. vCenter and VVol integration allows for efficient, single-pane management by VM Admins. Manage storage and virtual volumes – Provisioning, Data protection, Monitoring – just like you would any other infrastructure resource, without the need for specialized expertise. Nimble Storage requires 10%-30% less memory than comparable storage systems. Nimble delivers 5X or more data reduction vs. competitive All Flash systems. Store more VMs, as well as application and end-user data, in the same space with inline universal compression and other efficiency features. Nimble InfoSight™ predictive analytics lets you anticipate storage needs, simplifies planning, and with VMvision even helps optimize virtual resource utilization. InfoSight detects 9 out of 10 issues proactively, helping ensure 99.9999% uptime across the installed base. VMVision extends visibility into vSphere, enabling rapid cross-stack Root Cause Analysis, including Host and VM activity. It pinpoints “noisy neighbor” VMs, and presents latency and performance across host, network and storage. 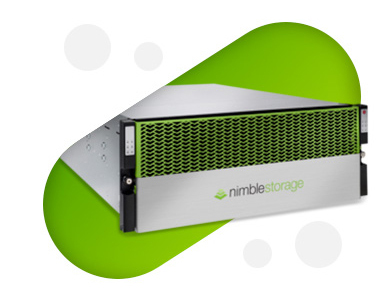 Nimble Storage systems enable Backup, DR and archiving at a third of the cost of alternatives. Realize up to 66% lower TCO than other comparable enterprise data platforms with Nimble.